Here are some behind-the-scenes shots taken during the summer of '84, while Steve was filming his new movie, Big Trouble -- only in 16! 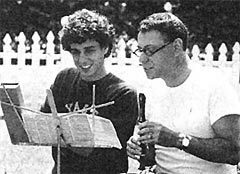 A good musician, Steve (left) gives his co-star, Alan Arkin, a few musical tips. 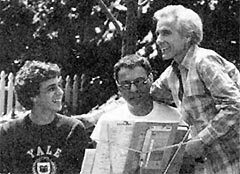 This time, it's Steve who's getting the tips, from the film's director John Cassavetes (far right), as Alan listens in. Also co-starring in Big Trouble is actor Peter Falk, best known for his role a few years back in Columbo. 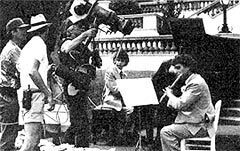 As the camera gets ready to roll, Steve, the versatile musician/actor, takes up his flute. Although music is important to Steve, he claims that playing it in front of a camera is even more rewarding, especially in Kidd Video where each member gets a chance to "show audiences what we can do week after week. Each week we might switch off on instruments or get a chance to sing lead. It's fun."